I create prophetic art while staying in tune with God’s presence. I draw and paint by faith, waiting on the Lord to lead and guide me. Sometimes Holy Spirit pops an idea into my mind that eventually becomes a picture. At times, the only thing I have when I begin a picture is a desire to do art. After prayer, I may receive a visual impression of what to do or where to start; at other times I begin with a bright ribbon of color and expect to ask God for help if I get stuck. I look for things to show up and flow with the creative process. I have learned to hear God’s voice in colors, shapes, feelings and impressions. I listen to music. I listen to the flow of God’s presence. In the picture, Hearts on Fire, I began with a desire to show the excitement and fire of outpouring revival. A shape showed up that became the Holy Spirit. The cross that looks like a sword with a rainbow banner came after prayer to bring balance to the picture. It represents the sword of the Spirit, the Word of God, and victorious Jesus. This part brought wholeness to the message. I use that part of this picture to represent the power of prophetic art. 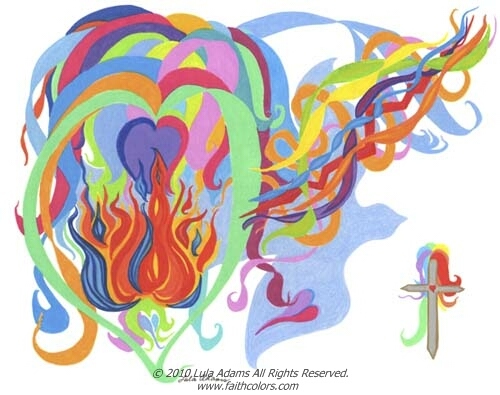 Hearts on Fire is done in colored pencil. 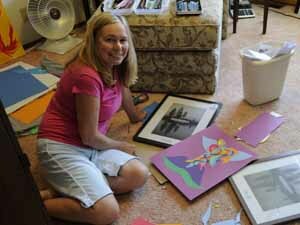 I also enjoy using acrylic paint, watercolors, and sometimes markers to create my art work. Prophetic art draws me into intimacy with God. His word comes alive with colors, shapes, and movement. Does this intimacy I find with God speak to you? Can you see God’s love in prophetic art? To see more on Prophetic Art please visit Lula's Prophetic Art Blog. ©2007 - 2018 Lula Adams, all rights reserved.